Last year, the U.S. Fish and Wildlife Service downgraded the West Indian manatee’s status from endangered to threatened under the Endangered Species Act. Save the Manatee Club is concerned that downlisting will further slow efforts to secure key habitat protections needed for the species’ longevity in Florida. In order to sustain the progress made toward recovering the manatee, increased reporting of manatee boat strikes and a stronger emphasis on preserving and restoring warm water habitat are essential. Florida Fish and Wildlife Conservation Commission (FWC) statistics indicate that the two most recent years – 2016 and 2017 – resulted in record manatee deaths from boat strikes. Manatees injured by boats stand a much better chance of being rescued and rehabilitated if they are found as soon as possible following collisions, but many accidents go unreported. The lack of data makes it difficult to distinguish between accidents versus incidents – whether waterway conditions, operator inattention, or some other factor is primarily responsible. Increased reporting of vessel collisions with manatees can also better inform policy-making related to manatee speed zone development and revision. Boaters can help protect manatees by observing manatee speed zones, wearing polarized sunglasses in manatee areas, and reporting any sick, injured, dead, or tagged manatees to FWC at 1-888-404-FWCC (3992). Securing sufficient natural warm water habitat for manatee use during the winter months is key to the species’ recovery. Historically, manatees sheltered in Florida’s natural freshwater springs, with their constant 70+ degree temperatures and nearby aquatic vegetation upon which they could feed. However, as spring flows declined from excessive groundwater pumping and hydrologic projects impeded access to some historic habitat, approximately two-thirds of Florida’s manatees learned to rely on warm water effluent from industrial discharges. This reliance has altered manatee migration in recent decades. Looking to the future, power companies are changing how power is generated in order to meet environmental standards and move towards sustainability. 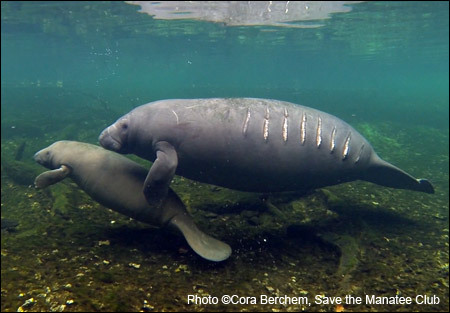 As a result of these much-needed improvements, protecting and restoring springs and travel corridors connecting these vital sites will be imperative for manatee survival, as will a strategy to transition manatees to these alternative sites. One viable starting point would be to breach the Rodman Dam on the Ocklawaha River in Marion and Putnam Counties, in order to restore manatee access to numerous springs whose flow is impeded by large volumes of impounded water. The federal and state governments have long acknowledged the need to restore the river, but the project remains stagnant in the absence of political will and agency leadership. Without an adequate plan to address warm water habitat, it is easily conceivable that positive manatee population trends could reverse without the same potential for recovery as when they were first listed. Anne Harvey Holbrook is the staff attorney for Save the Manatee Club, where her work focuses on water quality and quantity and endangered species issues. She has her JD from Georgetown Law and her Masters in Aquatic Environmental Science from Florida State University.